As children we called it make-believe. As adults, we call it reenactment. A lot of people participate in some form of this or other. Whether they do cosplay at conventions and symposiums, live action role playing (LARP), Steampunk, Civil War or Revolutionary War, people still take time out from their regular lives to basically play. I personally have been a part of this for over half my life. As a freshman in college, I was introduced to the Society for Creative Anachronism (SCA). This world-wide organization does various medieval reenactments spanning from the end of the Roman Empire (approx 600AD) to the death of Queen Elizabeth I of England (approx 1600AD). 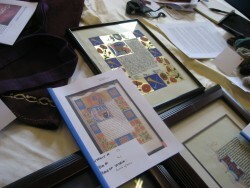 Members of the SCA (called SCAdians) can learn and take part in all kinds of medieval arts and sciences (cooking, calligraphy and illumination, dance, music, fibre arts, etc.) as well as various forms of combats (heavy armored combat, rapier (fencing) combat, archery, equestrian, thrown weapons) and many other really cool things from all over Europe, Japan, Persia and such during the previously mentioned time period. On many a weekend over the past two decades I have dressed (sometimes well, sometimes less so) as a 16th Century Englishman I have named Malcolm Bowman. During these events I have participated in various fencing tournaments, partook of often sumptuous medieval feasts, and danced with some very lovely ladies. I also have served as a steward of events, a marshal (coach/safety officer) of fencing and archery, and a herald (cryer) for the King and Queen. This is a whole other world it can be very easy to get lost in. But escaping into that world can be tremendously fun! I have made some amazing friends along the way, and am constantly amazed by how far around the world those people can be found. I attend fencing practice weekly, other occasional meetings, Saturday and whole-weekend events, and even “wars”. One such event is the Estrella War, held in Arizona every winter (used to be February, now it’s in March). 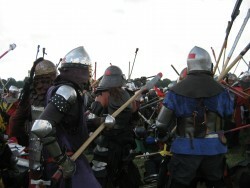 This event draws somewhere around 7000 people, and over the course of a week or so all kinds of combats and arts and more take place. I love playing this game. I love dressing in the garb and experiencing what amounts to a whole new world within the world I occupy. It is a fun-filled escape, and can be quite the party if so desired. 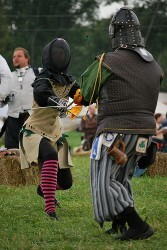 For some this is THE event they most enjoy in the SCA. 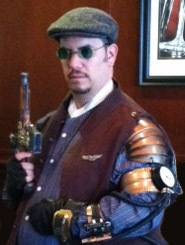 I have found that in addition to participating in the wondrous world of the SCA, I am also quite the fan of getting dressed up in neo-Victorian Steampunk gear. The outfits are rather amazing, and the addition of fantastical steam-powered weapons are pretty cool. I have found considerable inspiration from the Steampunk in my writing as well. I am hard at work, currently, on a Steampunk-themed novel. Creativity and escapism make the world of reenactment a terrific adult game of make-believe. I wonder that if more people participated in such, would we see less stressed, more creative and happy lives? Do you still make-believe in some way? 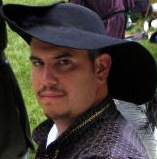 I am MJ Blehart, rapier-wielding writer of “Wednesday’s Wondrous World”. Every week I share a wonder of this amazing world, and I hope you will enjoy the journey with me!